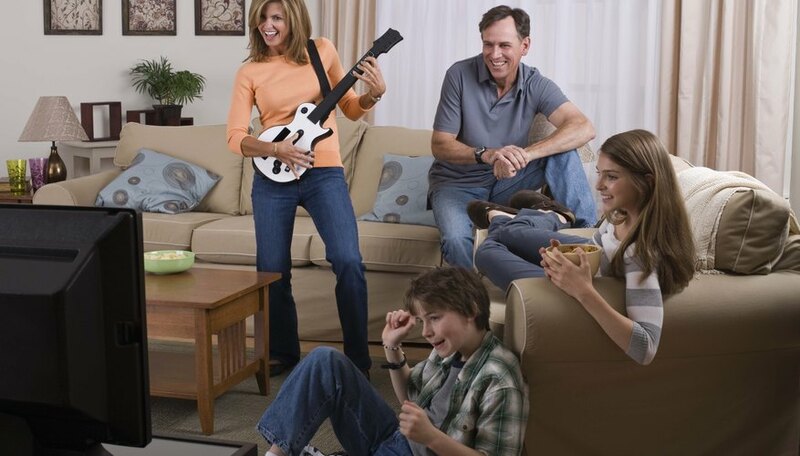 The guitar controllers used in the game Rock Band can malfunction with overuse. One of the most common problems is to have a fingerboard fret button that sticks. This can be very frustrating when playing the game. Fortunately, in most cases there is a relatively easy fix. The reason the button sticks is because a small metal piece inside the button has become dislodged. Fixing the button is as easy as putting the piece back in place. Remove the broken fret button. You should be able to get your fingernail underneath the actual button. Simply pull with ample strength in a manner similar to opening a soda can and it should pop off. If your fingernail doesn’t work, you can also use a butter knife to get under the button. Locate the small metal piece. It looks a little like the letter "C." It will most likely be inside the button’s hole. You will probably be able to just pick it up with your fingers. But it may be stuck. If it is, use the butter knife to dislodge it and pull it out. Snap the metal piece back into the button. On one side of the fret button that you have removed from the guitar there are two little clips. Take the metal piece and snap the long end into these clips. The piece should wrap around inside the button's enclosure. Replace the button on the guitar. Make sure the button is right side up, then simply press it back into its former slot. Now that the metal piece is replaced, it should snap in without too much difficulty. Press the button to ensure it is working properly. It should move the same as the other buttons, and you should be able to play the game. If you are not able to fix the guitar, you can get it fixed or replaced by Harmonix. The company offers a warranty guaranteeing their equipment, and will solve equipment problems with no cost to you. The link to the Harmonix website is included below. Most Guitar Hero controllers will work with the Rock Band game, but they are built differently. Fixing a Guitar Hero controller is a different process, but there is a link to a video at the bottom of this article that can show you how to do that. Lex Hubbard began writing professionally in 2008. He has written numerous published articles about a variety of topics such as video games, guitars and science. He is currently writing a novel. He graduated with a bachelor's degree in telecommunication from the University of Florida in 2009. How Can I Fix a Broken L1 Button on My PS3 Controller?